I was recently asked about using social marketing to make branded content more discoverable, and how to use social to foster a deeper level of engagement with a brand. They asked for examples. Here's my off-the-cuff answer with some hemming and hawing of course--what consultant doesn't like to hem and haw? Can a Brand Go Viral? Humans shows up in people's feeds because it gets shared, and because they like the page, and then you read them because we love to read about each other, we love each other's stories, we love to see all the ways we're connected. Holiday Inn shows up in people's feeds because they pay to be there. But they're trying to associate their brand with the human story angle, with a dash of upworthy 'we're all in this together', and hope that association sticks. The trouble with this for me is that Humans comes out of one person's passion, and his singular focus doing what he loves to do, whereas the Holiday Inn campaign is obviously cooked up by an ad agency. It doesn't feel honest, because it's trying to sell that you should stay at Holiday Inn by telling these human stories. To me the various Dove campaigns--The Real Beauty Campaign including the Real Beauty Sketches web videos--are still the absolute best when it comes to this kind of thing, because they aren't selling Dove at all. They are asking questions about beauty that women are currently trying to come to terms with--body image, age, etc. That said, there are still tons of critics out there who have all kinds of negative things to say about the campaign. In a post Marshall McLuhan world we just have a hard time trusting big brands to be the keepers of these difficult conversations, or to be the representatives of these values. How do we incorporate mistakes into the design process? 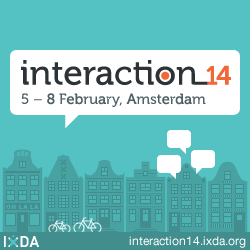 Come to Amsterdam and help me define a Mistake Manifesto. If good design requires failure, how can designers f*ck up when failure isn’t considered an option? Edison famously said, "I failed my way to success." In the interactive world, we've all heard the buzz phrases about failing fast, and how failure--particularly in the form of prototyping--can be a powerful design tool. But what about real failure? We've all experienced projects that never got off the ground, or crashed and burned stunningly. We don't put them in our portfolios. We only talk about them when we've had one drink too many. What can we learn from our embarrassments? And are there really things we can learn by failing, especially in the agency and consulting worlds, where we are hired for our expertise, and infallibility? Can there be actual power, and knowledge in failure? What is your biggest failure, and what did you learn from it? What are the different ways you can fail? Have you ever had a "successful" project that was a personal failure? Why? What can you learn from it? Why are we so afraid of failing? What are the negative consequences of failure? And how can we encourage a positive viewpoint on failure? How can we pull victory from the flames of defeat? How do you not panic when you sense yourself failing? How can you use your failure to inform future successes? How can we build an acceptance of failure into a design or consulting practice? How can we get away from always having to be right, and move towards creative adaptability? I just submitted another interactive panel for 2014 SXSW called F*CK UP Innovation. If you like the idea, please vote for it. Thanks! by the Interaction Design Foundation. Like our other authors, you get lots of writing invitations. However, this one is different: We are the first and only Open Access publisher of top-quality books in the world. We offer complete, unrestricted and free access to our books in online version. Thanks, guys! I'm flattered, and I'm tempted. I like what the organization stands for, and they seem to have published some really interesting ID books from some smart people. Only problem is, I have no idea what to write. What do you guys thinks? Are there any UX/ID topics that you find fascinating that you'd like to see a book written about? Product strategy from an ID perspective? ID and physical computing? Something about storytelling across multi-platforms (which I'm loathe to call transmedia)? Branding from an ID perspective? In Austin? Come see me. After that? Standing in lines--for movies, for panels, for barbecue... you get the idea. Thank you, Dana Stevens, for coining the term "Artisanal Horror"
I'd like to think I got my start in the world of Artisanal Horror though Dana might think differently of the direct-to-video screamers I had the pleasure of working on during the 90s such as Return of the Living Dead III, Necronomicon, Pumpkinhead II, and Leprechaun III. And what I loved about working on them is exactly what she describes here--the need for "cheapskate ingenuity". Sure we worked hellishly long hours, in pretty inhumane conditions, and yup, we did it with very small budgets, and very little pay, but there was nothing more fulfilling, and exciting for me than showing up for work, and instantly diving into the job of creating something cool, creepy, bloody, or bizarre, with the limited resources I had to work with. I've always believed there's nothing better for sharpening creativity than limits. Sure, what we created didn't look polished, or even real (case in point, the not quite decapitated head above) but that was the charm of it for me--that cheapskate ingenuity, and the visual style that comes from it. I've always loved that about horror films. From Frankenstein to From Beyond. How a filmmaker can create a whole new world, populated with nightmares, just using light, latex, paint, plywood, and shadows. It sends chills up my spine. You never forget your first love. When I was a little kid, my father introduced me to horror through the original black and white King Kong, and I fell in love. Sure, you could see Harryhausen's fingerprints all over the fur of King Kong, but that didn't take away from how terrifying he was, for me it somehow added to it. So when I decided to write, and produce my own movies, well, I couldn't help but want to reanimate that feeling of falling in love. That's why I wrote, produced, and acted in movies like Blood Junkies, and The Ghost Club - Spirits Never Die, and why I'm working on Cryptids, and PDA--feature films that definitely fall squarely on the artisanal horror film spectrum. I'm just psyched to finally have something to call myself, and what I create. Blood Junkies Teaser from Small Media Extra Large on Vimeo. The Ghost Club: Spirits Never Die. A feature film written by me, produced and directed by Hank Blumenthal, with an awesome ensemble cast, including yours truly. Fun and descriptive! I worked with the brilliant folks at Funny Garbage to design the app, which, well, just watch the promo... you'll see. It's nifty! "...one of the best new interface books on the market." Simply put, Interactive Design is one of the best new interface books on the market. It is comprehensive, easy to understand and extremely relevant using case studies and modern mediums to help connect with the reader. The book is designed for both students and professionals as the concepts are timeless in nature and although some of the topics can be fairly technical the way the book presents information using nice full-page quotes, beautiful diagrams and feature works makes it easy for even a novice to take on board. Although most of the examples cover graphic design interfaces like portable computers and website interfaces, it is absolutely relevant to product designers. The principles are very much universal, things like competitor analysis, user-path diagrams, research, testing are all great ways to improve your product designs. Unusually I don’t have any major faults of this title, so that is definitely saying something! Although it is heavily branded as being a theoretical book the information takes on its own lessons and breaks up the information well. The title is not text heavy or extremely weighty at 224 pages, so for true theologians this might not contain the analysis and literature references you may desire. However for the 99% this book hits all the right spots! Or "You can have my buzzword when you pry it from my cold dead lips..."
Despite my web 1.0 bias to the term (we beat "convergence" into the ground at every pitch, client meeting, and presentation back in the late 90s) I had a great time at the NY Film Festival's first ever transmedia conference--Convergence. If you work in advertising, or media and entertainment, "transmedia" as a buzz-word is approaching the late 90s beaten-like-a-dead-horseness of "convergence", but I'd be willing to bet most ordinary folk have no idea what the word means. At its simplest, what transmedia means is to tell a single story/story experience using different types of media and formats (if you want to get all buzz-wordy, we call 'em "channels" or "platforms"). For example you might tell your main story in the form of a movie at movie theaters, but you might expand upon the world you've created, explore sub-plots and characters, and even do some much needed exposition as a cartoon on TV or the web, in novels, comics, video games, and even games in the real world. Star Wars is the media property us horse-beaters talk about when we talk about transmedia. In the Star Wars universe (storyverse) a regular old audience member can watch the main story unfold in the 6 blockbuster movies, but more engaged fans have so many other places they can go to learn about the Star Wars world--The Clone Wars TV Show, video games--including the awesome ones created by LEGO--in comics, and novelas, not to mention the legion of fan created content that's out there... which may not be official "canon" but I maintain is still a valuable chunk of transmedia. I could go on... and I will, in future blog posts. Why? Well, mostly because in some form or other I've been "converging" and involved in the creation of transmedia properties for the past 15 years or so. Not quite as long as the term has been around--Marsh Kinder first wrote about transmedia in 1991--but long enough to have accumulated some thoughts on the subject. I'd love to hear what you think, what's transmedia to you? New Cartoon Network app launches! The coolest project I worked on last year just showed up in the app store. Now you can watch your favorite Cartoon Network shows and play Cartoon Network games, all in the same easy-to-use app! Simply turn your device to flip instantly between watching video and playing games. And on the iPad, you can even use the split screen mode to watch and play at the same time! Last year I worked with the fine folks at Funny Garbage, and the awesome team at Cartoon Network, to help design a ground breaking new iOS app. What's cool about it other than the fact that you can watch full episodes of Cartoon Network shows, and play some awesome games, and other than the fact that you can do both of those things at the same time? What could be cooler than that? you can watch full episodes and live TV from Cartoon Network. you can play games. Pretty nifty, huh? This was definitely my favorite project of 2011. I'm really proud of the work we did. I'm so excited it's in the app store. Download it! It's fun. 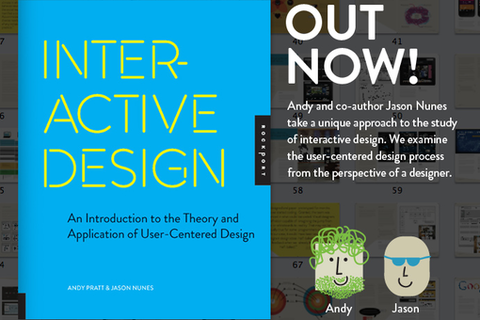 You can pre-order Andy Pratt's and my book--Interactive Design: An Introduction to the Theory and Application of User-Centered Design--on Amazon. The book, published by RockPort Publishing, will ship September 1st. User experience design is one of the fastest-growing specialties in graphic design. Smart companies realize that the most successful products are designed to meet the needs and goals of real people—the users. This means putting the user at the center of the design process. This innovative, comprehensive book examines the user-centered design process from the perspective of a designer. With rich imagery, Interactive Design introduces the different UX players, outlines the user-centered design process from user research to user testing, and explains through various examples how user-centered design has been successfully integrated into the design process of a variety of design studios worldwide. I just put up a page of some of the many prototypes I've designed over the years. Prototypes have been an essential part of my design process for years. I started as a broadcast designer utilizing storyboards as a way to test out, and pitch design ideas to clients. In broadcast design, and filmmaking, storyboards and animatics are the prototypes. In interactive design prototypes are a great way to test out ideas without having to spend the time and money to built a fully functional site or applications. Prototypes can tell the story of an application, explore different interactions models--the different ways users could navigate an application, and allow designers to test out their ideas with users. How do you use prototypes in your design process? Routehappy will change how you book air travel. Like Yelp for airlines, airports, routes, and flights, Routehappy's goal is to make air travel better by giving flyers a voice through reviews, and ratings. Last year around this time I spent several weeks of intense consulting time with Routehappy's CEO refining and clarifying their UX vision, and brand identity. I'm more than proud of the work. I'm a huge fan of the site. As someone who has always considered the black box of booking flights completely mysterious--there's got to be something more to consider than just price when you book your flight--Routehappy is a breath of fresh air. The word "story" is pretty close to losing its meaning when applied to interactive design. It's about to go the way of other buzzword dodos like "convergence"--the first word I remember becoming absolutely meaningless as more and more consultants, and executives spouted it in meetings in an attempt to sound smart. Right now, story is everywhere. Brands tell their stories on social networks. User experience designers talk about the power of story. Everybody and everyone has a story to tell, and everyone and everybody is some kind of storyteller--UX designers, copywriters, and strategists. The heartbreak with "story", and it's kissing cousin "storyteller" jumping the shark (to mix all kinds of metaphors in this blog post) is that various forms of storytelling are actually particularly powerful tools for creating great interactive experiences. Clearly written, concise, and easy to understand user stories are an essential scoping tool for developers who follow an Agile software development process. Detailed, researched, and compelling user personas, and scenarios help designers, and their clients undertand the people they design for--their "users" (another word that flirts with buzzword dodoism)--by telling their stories. Stories that help communicate what's been learned about those users, what they want, and the context in which they will try to meet their needs. Beyond that, good, basic storytelling is useful any time a designer communicates with their clients, users, developers, and each other. Stories help organize information, and put it into context. They're fun. So what's a poor storyteller to do--someone like me who actually writes stories in the form of screenplays, teleplays, and novels? Who writes user scenarios, and user stories as part of my design process? Who thinks in 3-act structure, and applies that structure to make documentaries, and textbooks more interesting, and fun? Who is addicted to exploring all the emerging new ways we tell stories, from transmedia to alternate reality gaming, and beyond? What do I call myself so I don't get lost in the crowd? How do I communicate what it is I do, and how I do it? For now I'm going back to calling myself a writer and UX strategist. A little dry, but it is what I do. Anyone have any better suggestions than that? The School of Visual Arts just launched the beta version of their new website. I worked with a Funny Garbage dream team of hotshot UXers and designers to help define the experience strategy for SVA's first redesign since the early 2000s. SVA's programs and offerings had drastically expanded since FG's last, award winning design, and it was clearly time for more than just a refresh. Working closely with a dedicated team at SVA, the design team defined a flexible experience that could expand to support SVA as they continued to grow. Oh, and it looks freakin' hot too. I'm really proud of all of our hard work. For the uninitiated, PDA is a dark romcom I wrote in 2010 about a serial killer librarian who abducts a handsome casanova so he can teach her how to date. It is a testament to the talent of the writer to have been able to make such a detestable theme comedic and entertaining. The plot... is great, it’s original, entertaining as well as having that effect of making you want to turn away but keep watching none-the-less, like a car crash, you don’t want to see a dead body but you look anyway. ...we always suggest that people should not change and be true to who they are, but what if they are just horrible people on the inside? Any theme that makes the audience question their own values is going to be great. Or how I came to realize, and embrace what an enormous UX nerd I am. Mr. Tappy is a camer rig that makes it easy to film users interacting with their mobile devices. Mr Tappy came from humble beginnings - in fact, he originally was made from plastic cut with a hacksaw and bent over a household toaster. This solution worked fine as a usability filming rig a few years back when 'a phone was a phone' …but when touch screens and tablet devices arrived, a more flexible and stable solution was required. Through a series of prototypes and testing with some of Europe's largest technology design and research agencies, Mr Tappy was born. Mr Tappy was designed by Nick Bowmast, a UX researcher helping companies develop better products and services through customer insights. Often these products involve mobile devices and the insights come from watching them use products. I'm giggling like a school girl... Prototyped? Specifically for UX research? Swoon. Now if I only had an excuse to rush out and buy one. Anyone out there have an app they need tested? Horror movie review site, Shock Till You Drop, published a post about The Ghost Club--a film I wrote and acted in, which included new photos, and the trailer. The film, directed by Hank Blumenthal, finds William Forsythe in a story about a team of reality TV paranormal investigators who have yet to truly "make contact. They decide to try their luck at an abandoned mansion in the deep-south with a long history of hauntings. As the night unfolds, and the evidence begins to pile up , their skepticism turns to terror, and their initial goal of contact turns into the primal one of just making it out of this real haunted mansion alive. Learn more about The Ghost Club on Facebook. I’ve been a member of the design inspiration sharing social network for about a year now. I use it as a giant inspiration board. A place to save all the things I see throughout the day, on blogs, or that are shared by friends on twitter, that make me happy, and that I like. Up until about a week ago, that is. Before then Pinterest was simply a place for me to save the things I liked. Oh, sure, I’d get a few people liking my pins, repinning them to their own boards, or even following me. I thought that was kind of fun. I had notifications set to send me an email as soon as there was site activity, and I’d get about 10 a week. Maximum. And then, in the space of a day, all that changed. My inbox filled up with individual email notifications. Hundreds of them. The first thing I did was to turn off individual email notifications. And then I noticed something interesting. All these new likes and repins were only for a handful of my pins, and there was no uptick in the number of folks who followed me. It made me wonder what was going on? I know that Pinterest has been exploding of late. There are blog posts about how it drives more referral traffic than Google+ (and almost as much as Twitter), and that Pinterest is incredibly successful with women (80% of Pinterest users are women. I guess I’m just in touch with my feminine side.). Could all these new users account for my pin’s 15 milliseconds of fame? Or did Pinterest release some new feature that suddenly boosted my pins’ popularities?